Imagine sitting in the cabin of an Embraer 175 about to reach your gate, and over the PA a flight attendant begins thanking the customers aboard the plane. When Envoy Flight Attendant Michael Frederick is that person holding the phone, he likes to do things a little differently. That’s what you get when you encounter the little ball of energy that is Michael Frederick — he’s full of song, daily affirmations, positivity and advice. It’s no wonder that outside of work Michael is a professional singer, an ordained minister heavily involved in his church and a professional motivational speaker. Aboard one of his many flights, Michael had the opportunity to serve American Airlines CEO Doug Parker. He had been waiting to have Doug on his plane since the American Airlines merger in 2013, and he finally had his chance to show off his skills. Michael says he greeted Doug like any other customer, but told him that he likes to do things differently. 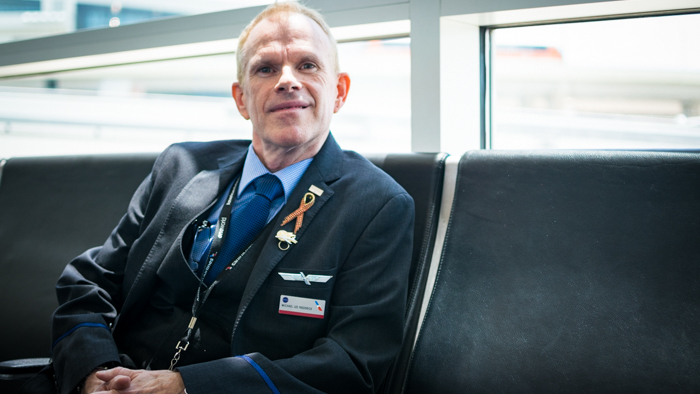 He greets every customer by name, shakes their hand and broadcasts his positive message over the PA.
On that flight, he says he handed out Kid’s Wings to two children and saved one for Doug. That’s Michael’s style as a flight attendant; always happy, always entertaining and always spreading joy. 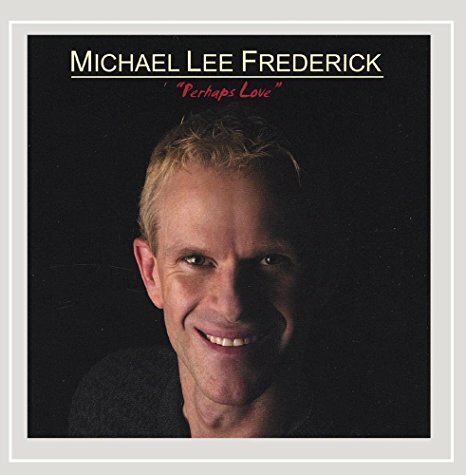 Michael has been singing opera professionally for 14 years in Dallas and San Francisco — and if you’re interested, he has an album of standards called Perhaps Love, which features opera, jazz and standards. But Michael doesn’t sing for CDs, glory and fame – he has a mission to fundraise money for cancer research as a testament to his mother who battled with the disease. To this day, Michael has sold over 400 thousand albums raising more than $94 thousand for charity. But that’s not saying that he couldn’t be famous. In fact, Michael made it as far as the third-round of X-Factor and almost became the oldest contestant on The Voice. Even though Michael hasn’t made it to network television with his massive voice, he has sang with the likes of Bette Midler and performed at prestigious venues from San Francisco to Fort Worth’s Bass Performance Hall. Michael says that he was surprised by Fort Worth Mayor Betsy Price on one of his flights who, after hearing Michael sing, asked him if he’s ever sang at the Bass Hall. For Michael, that statement holds true in his position as a flight attendant, too. Whether it’s delivering top-rate customer service, sharing words of confidence or interacting with colleagues, Michael tries to build his reputation as one of Envoy’s best flight attendants. He says that his key to happiness at work is “to love what you do and do what you love.” For Michael, it’s the people that make his job special including customers, colleagues and management. Michael says he’s had opportunities to fly for American Airlines and other airlines, but he stays with Envoy because he likes the intimacy he has with his customers and coworkers. 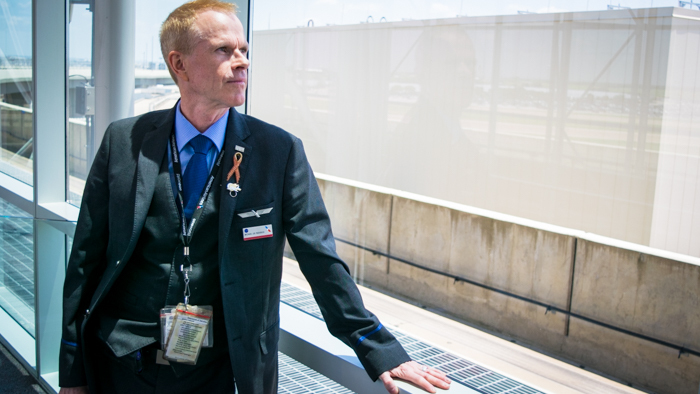 Keeping that positive attitude is something that Michael, who also works as an Initial Operating Experience instructor, tries to impart on new flight attendants who fly with him. 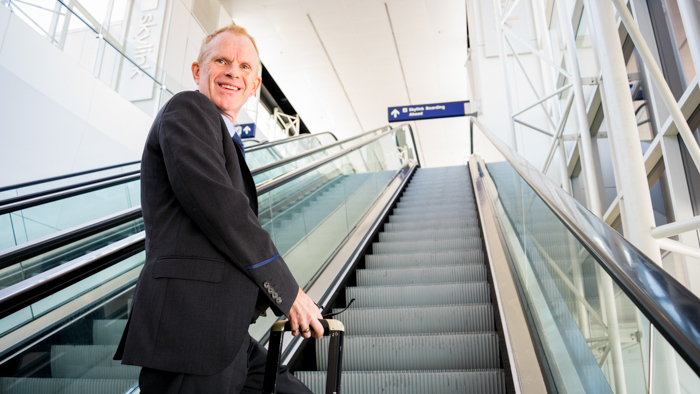 At 58 years old and 14 years with Envoy, Michael has experienced just about everything that could happen as a flight attendant. Even with all of the curveballs and wrenches that could be thrown his way, Michael says that he still hasn’t had a bad day. 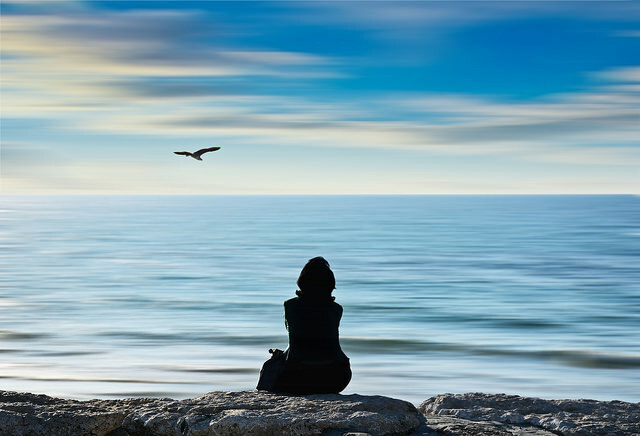 Author’s note: During the interview, Michael was full of philosophies, affirmations and little phrases we’d like to share with our readers.